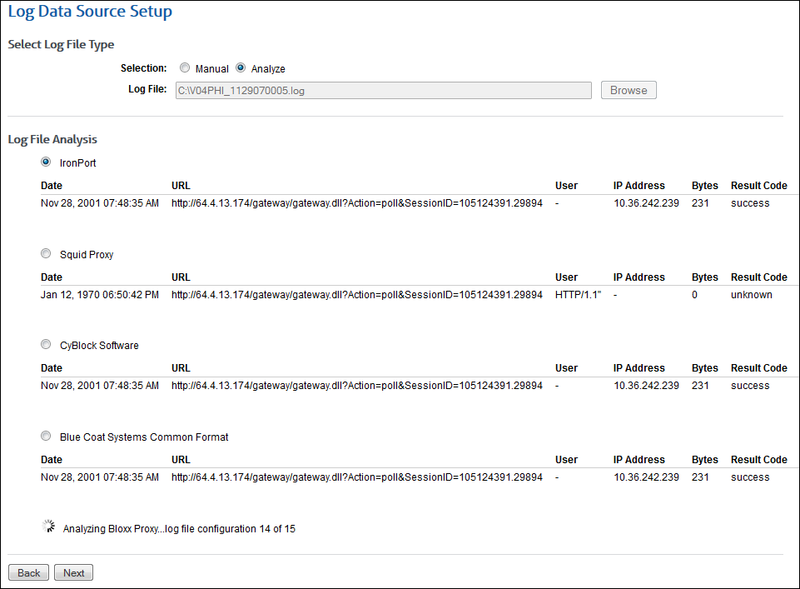 Another exciting new enhancement from Wavecrest…Cyfin Automatic Log File Detection! Wavecrest Computing is excited to announce a new enhancement to our Cyfin Log File Analyzer Solution, Automatic Log File Detection. This enhancement allows for the easy setup and import of log files by automatically analyzing and matching the closest suitable log file types. You no longer have to worry about making sure you select the correct log file type manually before importing. All you have to do is locate your log file and select. Cyfin Automatic Log File Detection will display a short list of matches with sample data in fields, allowing you to select from the list the best log file type ensuring you are getting the best match available. Constantly improving, developing and enhancing, to make your Web security more efficient, Wavecrest Computing has been the recognized leader in Web Security Solutions for over 19 years. Wavecrest’s scalable filtering and forensic reporting analysis product lines, CyBlock and Cyfin, are designed to enable organizations to successfully address Internet abuse, legal liability, shadow IT, workforce productivity, Malware, and many other Web security threats. Posted in Cyfin, New Releases, Product Updates | Comments Off on Another exciting new enhancement from Wavecrest…Cyfin Automatic Log File Detection! We have recently added support for the WatchGuard Log Server PostgreSQL database and Websense in Cyfin Reporter 8.2.2. If you are interested in the added support for either of these logfile types, you can check out the simple configuration for each at the links below. If you have any questions or would like additional help in the configuration process, please contact technical support. They will be happy to assist you. Cyfin Reporter supports over 95 other different log file formats, so if you need support for other log file formats, visit our Cyfin Reporter technical specifications page to see if we support them. If not, contact our technical support team, and we will be happy to see if support can be added. URL Hyperlinks in Detail Audit Reports. URLs listed in Audit Detail reports are now hyperlinked if the following conditions are met: 1) the Data Manager is enabled, 2) Interactive is selected for the Report Type, and 3) the total number of URLs for a single report is less than 50,000 URLs. The reports with this functionality are User Audit Detail, Category Audit Detail and Site Audit Detail. More Drill-Down Capability. On reports that contain Hourly Visits and Hourly Bandwidth tables (such as Site Analysis), you can now drill-down to the single hour of activity of your choosing.